Mike Pence, Paul Ryan, and James Lankford have all brushed aside concerns. It’s been a disturbing week of violence in the United States: A Florida man was arrested for sending bombs to 13 prominent Democrats and critics of the president; a white man in Kentucky shot and killed two black people at a grocery store in what appears to have been a racially-motivated attack; a Pittsburgh man killed 11 people in a synagogue in what has been deemed a hate crime. That’s led to questions about whether President Donald Trump’s rhetoric and divisiveness have played a role in encouraging violence or, at the very least, need some toning down. Republicans don’t want to talk about it. Vice President Mike Pence at an event in Las Vegas on Saturday called for “unity” and decried the shooting at the Tree of Life synagogue in Pittsburgh as “evil” and criminal. “There is no place in America for violence or anti-Semitism, and this evil must end,” he said. In a subsequent interview with NBC News, he was asked whether Trump calling Democrats a “mob” might be something to reconsider, given recent events. He hedged. 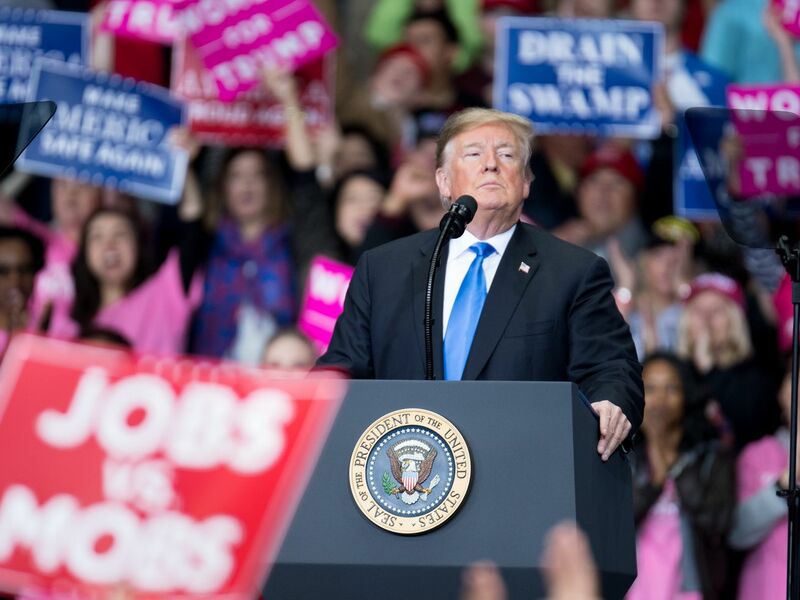 Trump’s response to the pipe bombs has not been one of firm condemnation — at a rally in North Carolina on Friday, he decried “political violence” and then resorted to his normal attacks on the media and encouraging the crowd’s “lock her up” chants. He acknowledged that he was supposed to be “nice” in light of recent events, but he just couldn’t help himself. At another rally the following day, he toned it down a bit — not calling Hillary Clinton by his usual nickname for her, “Crooked” — but continued to lob attacks at Democrats, including Rep. Maxine Waters, who received a bomb this week. Pence on Saturday was also asked whether Trump’s rhetoric is healthy for the civil discourse. He said there’s no connection between “the kind of violent behavior we witnessed in Pittsburgh” and political debates. He placed some blame on the media, which he said isn’t covering bipartisan accomplishments and instead focusing on divisions. Dickerson asked him about whether Trump’s rallies, which often entail attacks on his opponents and fear-mongering about issues such as immigration and race, are an example of an attempt to unify. While there’s no precise one-to-one connection between the president’s rhetoric and the shootings and attempted bombings this week, there are common threads. Robert Bowers, the Pittsburgh shooter, in his social media posts attacked Trump as a globalist and said Jews were at fault for helping transport members of the migrant caravans from Central America. It’s not hard to see the similarities between these men’s beliefs and Trump’s rhetoric. The president often complains about globalists and at a recent rally declared himself a nationalist. The term “globalist” is often considered code for anti-Semitism. Trump has for weeks been stoking fears about the migrant caravan, and much of his appeal to his supporters is based on fear of immigrants and racial minorities. Though he strongly condemned the Pittsburgh attack and anti-Semitism Saturday, he’s failed to do so at other key points of his presidency, including after racist violence broke out in Charlottesville, Virginia last year. The president has pointed the finger elsewhere, saying the media is at fault for fueling political divisions and hate in America and has unfairly cast him as a contributor to the current situation. Many in the GOP are backing him up. Oklahoma Republican Sen. James Lankford, also on Face the Nation on Sunday, said the Pittsburgh shooter’s beliefs couldn’t be tied to Trump because he considered the president a globalist who was allowing the caravan to happen (despite the fact that Trump is the one who’s keeping the caravan in the news). “I wouldn’t connect the president to this particular shooting, just like I wouldn’t see that connecting Democrats when a person walked up to a baseball game last year in Washington DC and said, ‘Is this where the Republicans are practicing?’” Lankford said, referring to the shooting at a Congressional baseball practice last year. Lankford acknowledged that the president’s conduct has not, perhaps, met the standard for public discourse that would be expected. “I think that the president needs to be more clear in his rhetoric and doesn’t need to be as caustic in his rhetoric,” he said.